Our databases have lots of information from trusted sources that’s typically not available through the Internet. Canadian Newsstand – (Library Card Required) Full-text access to over 200 Canadian newspapers, including The Globe and Mail, The Vancouver Sun and many local BC papers. Coverage back to the 1970s and 1980s for some newspapers. RBdigial- (Library Card Required) free, unlimited, 24/7 access to over 300 digital magazines, viewable on your computer or wireless mobile device. British Columbia Statistics – Statistics on population, business, the economy, labour and society. 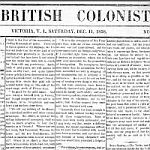 British Colonist – Every page of every issue, from the first one on December 11, 1858 until the end of June, 1970 has been scanned and made searchable.